The recent price drop of the Nook Simple from £79 to £29 has created unprecedented demand for the e-reader causing low availability from the limited number of UK retailers which supply it. The price reduction is understood to be only temporary as part of the "Get London Reading" initiative and the developers, Barnes & Noble, are not letting on when the offer is likely to end. Developed by Barnes & Noble, the Nook Simple Touch is an e-book reader featuring an adjustable 6 inch touch screen which enables you to read in the sunshine or in a darkened room glare free. Customise reading text with 7 different sizes and 6 font styles. Built in Wi-Fi enables to easily download books in seconds and with over 2.5 million available you won't be short of available titles (over 1 million are free downloads). You can also preview books before you buy and subscribe to newspapers and magazines also. 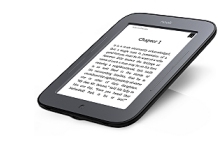 It's possible to run the Nook Touch for over 2 months on a single battery charge and with 2GB of internal memory you will be able to store up to 1000 books (expandable to 32GB with an additional micro SD card). Supported e-book formats include ePub5 and PDF and weighing just 212 grams it's lighter than a lot of paperback books! MicroUSB cable to connect to your PC/Mac. We constantly check for Nook Simple Touch stock, so you don't have to. 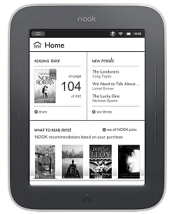 Receive email alerts when Nook Simple Touch online stock is found.